Grit Expectations: How and when are our roads and footpaths salted during the winter season? As temperatures plummetted towards the end of November 2017, forecasters began to predict the coldest December in seven years. Meteorologists are suggesting winter 2017/18 could be colder than normal with the return of an atmospheric phenomenon known as La Niña. La Niña events tend to occur every five years and increase the chance of cold weather, as was the case in winter 2010 when much of the country was covered in snow. Ice and snow on roads and footpaths has the potential to cause a number of problems on the road network, from a simple slip and bump to a major accident causing injury or even death. With snow and ice making a return in recent days, this blog article looks at the steps taken by government to deal with ice and snow to minimise the risk they pose here in Northern Ireland. The Department for Infrastructure’s (DfI) Roads Division is responsible for the maintenance of over 25,000km of public roads together with about 9,700km of footways, 5,800 bridges, 290,000 street lights and 367 public car parks. One of the key objectives for DfI Roads Division is to: manage, maintain and improve the transport network to keep it safe, efficient, reliable and sustainable. As part of this it will routinely grit roads between 1st October and 30th April each year, during what is known as the ‘winter service’ season. DfI has a duty to remove obstructions in the road caused by accumulations of snow under Article 10 of the Roads (Northern Ireland) Order 1993. However, although the Department commits a substantial resource to the gritting of roads, around £6.2 million for 2013/14, it is not required to do so. Under Article 9 of the Order, the DfI has discretionary powers to take preventative measures, including gritting, so that ice and snow do not interfere with the safe passage of persons and vehicles using a road. It can do this itself, arrange for contractors to do it, or leave materials for members of the public to use. In a normal winter, DfI Roads Division’s ‘winter service’ is a major logistical undertaking that involves around 300 staff and a fleet of 130 ‘gritters’, on call every day to salt the busiest parts of the road network. Almost 7,000 km (4,300 miles) of roads are salted which is 28% of the length of the road network and salting it costs £4.5M in an average winter. How does DfI choose where to grit? Maximise the benefit by targeting roads which carried the heavier traffic flows. Approximately 4,800 salt bins and almost 50,000 grit piles are provided on public roads for use by the public on a self-help basis. When does DfI not grit? In the middle of the night and on roads with fewer vehicles, as traffic is required to turn salt into de-icing solution. The most recent review of winter service took place in June 2013. The review concluded that DfI has developed and implemented a robust, risk-based rationale for determining the extent of the road network that is subject to routine precautionary salting during the winter months. 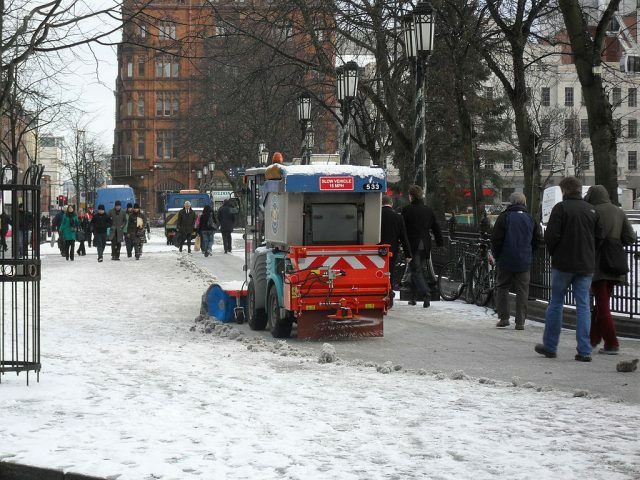 DfI Roads Division does not routinely salt footpaths but, where resources permit, it has agreed to work with local councils during prolonged periods of snow and ice to clear footways in busy town centres. This had been an area of contention in previous winters, largely due to the fact that there is no statutory duty on either the DfI or local councils to clear footpaths while there were questions around liability. It finally came to a head during the big freeze of 2010, prompting the Attorney General for Northern Ireland to advise that if snow/ice was dealt with carefully, “you are unlikely to be held liable”. Over the period 2012-16 snow, frost and/or ice have been noted as a ‘contributory factor’ in 10 fatal collisions and 68 serious collisions (see MAP 2 and MAP 4). By way of comparison, wet and damp conditions (see MAP 3, below) have been noted as a ‘contributory factor’ in 119 fatal collisions and 932 serious collisions. This relatively low number of accidents for which snow, ice and frost have been a factor could be an indication of many things including fewer people driving during these conditions, people driving with more care, the effectiveness of the gritting programme, and the number of days when snow, ice or frost were present during these years. The area shown in red in Map 3 is a ward called Stonyford. It has had 19 road traffic collisions (RTCs) due to snow, ice and frost between 2012 and 2016. That includes all collisions, slight, serious and fatal. This area includes Rock Road and Hannahstown Road. It is a rural, hilly area, with quarries and sits between Black Mountain and White Mountain. Over 115 days in the highest upland areas and the most frost-prone lowland locations, with a similar distribution to air frost.